WHAT IS A STYLED PHOTOSHOOT? Last Summer we had the opportunity to work with a handful of awesome vendors at our first ever styled photoshoot. Some of you are probably wondering what a styled photoshoot is. In it’s simplest form, it’s a “fake” wedding or photoshoot that is put together in creative collaboration with a group of wedding professionals. We come up with a concept and together, plan our ideal event down to the very last detail with the goal of capturing inspiring creative images to share with our brides and grooms. For this particular photoshoot, we landed on the theme of “Ombre-Glam,” inspired by Pantone’s hottest color, Custard, and the DIY-dyed coffee filter ceremony backdrop (the brain child of Emily at Hadley Road). The colors fit the season perfectly and the mix of DIY elements and gold glamour meshed seamlessly. 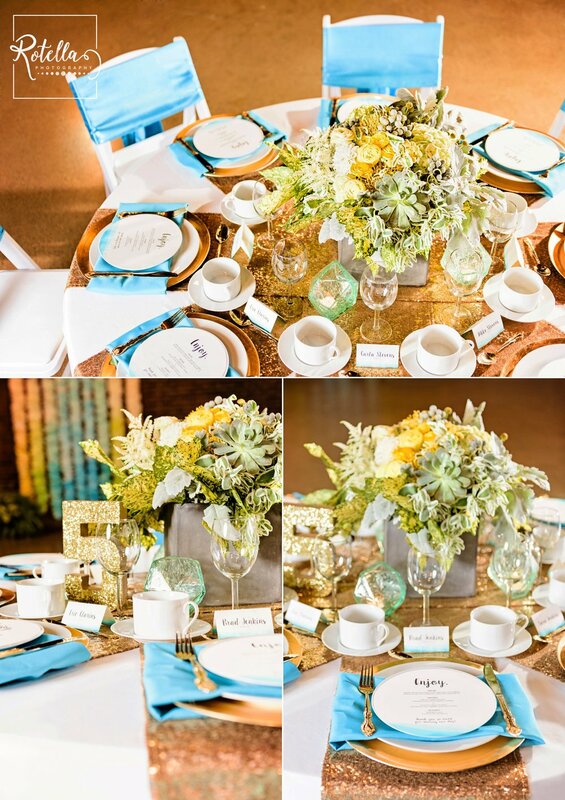 From the hand-made coffee-filter ceremony backdrop to the dip-dyed wedding invitation suite to the extravagant gold dinnerware, every detail was thought-through by Minnesota wedding professionals. Our hard work paid off as we were even featured on the blog Blooms and Bubbly! Set in the heart of the North Loop in Minneapolis, 514 Studios boasts a gorgeous urban event space. The event area combines an industrial style while also featuring an intimate setting perfect for celebrating with family and friends. The space is essentially a blank canvas - and for those interested in Minnesota wedding photography (aka: us), it was love at first sight! We had an amazing experience collaborating with all the below vendors for the first time and highly recommend any one of them to help with your wedding planning needs.